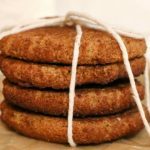 These gluten free cookies have 6 simple ingredients. Crispy on the outside and chewy on the inside. Cream butter/coconut oil and sugar together. Add egg and beat to combine. Add the mixed dry ingredients to the wet ingredients and mix well. In a small ramekin, combine coconut sugar and cinnamon together. Roll dough into equal sized balls about an inch in diameter. Roll the balls in cinnamon sugar making sure to completely fully coat the doughball. Place the balls on cookie sheet. Flatten each cookie to about 1/2 inch thickness with a flat measuring cup or mason jar. Bake at 350 F degrees for 8-10 minutes or until golden. You still want them to be soft, so don't overbake! Let cool on the sheet for 2-3 minutes before transfering to wire cooling rack.